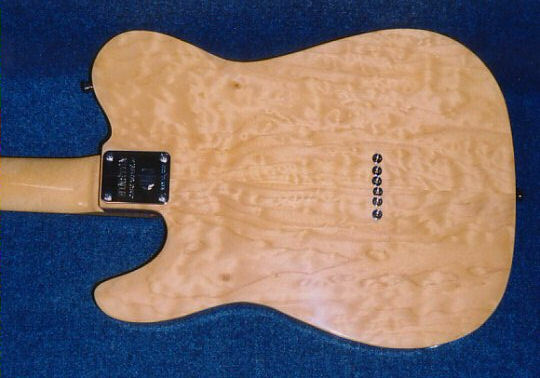 The woods used in the construction of this guitar were specially hand-picked by me and supplied by Exoctic Woods of Burlington, Ontario, Canada, which boasts some of the finest quality instrument-making woods. 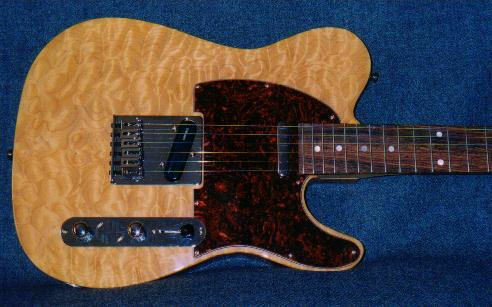 Among the outstanding features of Electra are its master-grade quilted maple top, highly figured AAA grade curly maple back, special V-profile maple neck, beautifully carved headstock, stack humbucker bridge pickup with coil-tap on tone control for a variety of humbucking and single-coil sounds. Mahogany centre core, master-grade quilted maple top and AAA Grade curly maple back. Special V-shaped bolt-on flamed maple neck with beautifully carved headstock and 2-way adjustable internal truss rod. Neck width 1 11/16" at nut, 2 1/4" at 22nd fret. 22 high quality 18% nickel-silver medium frets. 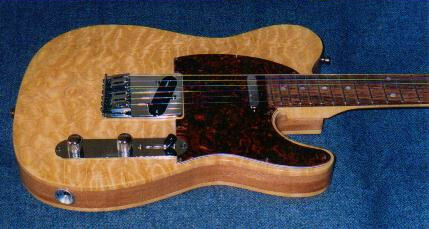 Seymour Duncan STR-1 single-coil pickup at neck and DiMarzio stack humbucker at bridge. Hardtail high quality brass bridge, chrome-plated with adjustable saddles. Master volume control, master tone and 3-way selector switch with coil tap on tone control for single-coil and humbucker tones. High quality chrome hardware with special monogram on control plate. Available colours are Transparent mild vintage amber with maximum grain enhancement.